This question was posed to participants at four different Community Conversations. These events—held in Cambridge, Kitchener-Waterloo, Woolwich Township, and Wilmot and Wellesley Townships—were a collaboration between Wellbeing Waterloo Region, the Kitchener Waterloo Community Foundation, the Cambridge & North Dumfries Community Foundation, and United Way Waterloo Region Communities. Each event included a panel of guest speakers, including Denise Squire, Executive Director of the Woolwich Community Health Centre; Fauzia Mazhar, Family Centre Coordinator for Family and Children’s Services of Waterloo Region; Waterloo Regional Police Chief Bryan Larkin; and other community members. Guest speakers addressed issues they frequently see and deal with throughout our region’s townships and city centres, and provided feedback on solutions they would like to see. Afterwards, community members in attendance participated in table discussions, where they shared their own personal experiences, observations, and initiatives that could provide effective solutions to issues within our community. 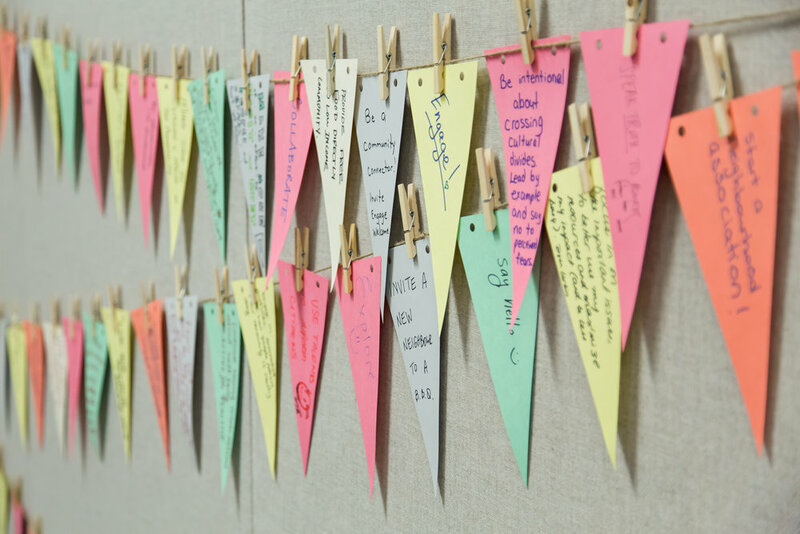 At the end of each session, participants wrote ideas about how they could help improve our community on paper flags, which were then put up on display. The Wellbeing Waterloo Region initiative took these ideas, as well as additional input from partnering charities, organizations, and individuals, and landed on 3 Big Ideas: Affordable Housing, Healthy Children and Youth, and Social Inclusion. They are continuing to work collaboratively to foster positive, sustainable changes in these three priority areas to enhance wellbeing in our community so everyone thrives and no one is left behind. Moving forward, Wellbeing Waterloo Region is focusing on establishing progress indicators, developing collaborative plans, and establishing a governance structure. They are also holding more community forums and conducting a community-wide survey to receive more feedback and support. If you are interested in attending an event or volunteering, please visit www.wellbeingwaterlooregion.ca.